Knowing where your money goes is the first step to being liquid. Recently we had a post about creating a savings plan. In order to do that, you need to start with a spending plan; today we'll delve more deeply into the necessary steps of creating a spending plan so you can live the life of financial freedom. A spending plan starts with a list of all your expenses; it's a lot easier to create a list if you have compartments in which to put the items into, that way it doesn't seem so formidable. These are the items that a due on the same day every month, and you know exactly what is due, such as rent, or a car payment. Like once a month and fixed, these items are also due the same day every month, but you have no clue how much they will be. These are your utility bills, such as electicity and water. These are the day-to-day items, such as gasoline and food. This is the area that kills people all the time. Annual expenses, such as auto insurance. It also includes items you wish to save for. Being liquid means buying only those items for which you have the money; if the money isn't in the bank, then you cannot buy it until the money is saved. Now it's time to start filling in the gaps. The first two categories above are fairly easy to create; you can simply go through a bank statement for a month and see the "regulars." However, third category, or the day-to-day stuff isn't so easy. This list will come from your daily receipts; at the end of each day start to compile your more than once a month expenses. Don't hold back, just spend like you normally do. At the end of the month, multiply each of your items by 12 to annualize them; you will be amazed. You may find that you spend $1,000 a year on soda; trust me, at $1.00 a can and three times a day, it's easy. Now take out the ax, well, not literally, and begin chopping. This is where the REAL savings come in. For the annual stuff and the things you're saving for, start the list and how much you need / can afford to put towards those items each month. If your expenses exceed your income, the shortfall comes from cashing in investments or increasing your debt load; neither of which should be done. 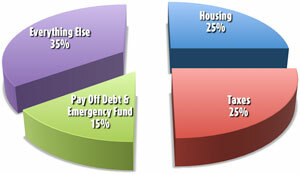 It's imperative to track your spending against your budget AS you are spending. This way you can see if you'll make it to the end of the month; for instance, if you have $500 to spend on groceries for the month and on the first day of the month you spend $100 at the grocery store, then you know for the remaining 29 days you have $400 left for groceries. Unfortunately, most get to the end of the month before they discover they've spend too much. Does this give you a good start to begin saving so you can get liquid? Let me know in the comments below.